Many of us take the first part of the new year – if not the whole year – to reorganize, rearrange and find new inspiration for making our homes look and feel fresh and well decorated. 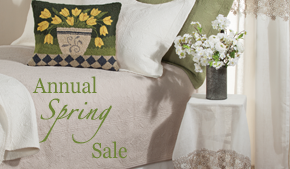 This means it’s time to flip your reversible pillows, move around the furniture in your family room, add some whimsical accents to your kitchen counters and take a look at your walls. That’s right, your walls: one of the most underestimated spaces in a home when it comes to decorating. 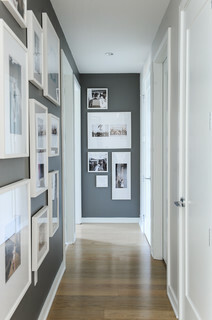 Gallery walls are always in style; it just takes a little browsing to find ways in which you like the pictures to be arranged and whether or not you like the frames to match up, and of course the act of collecting art or using photos to bring a blank wall to life. We have compiled a few images of gallery walls to help you find that inspiration, and if you have already created one in your own home, share it with us! Especially in smaller bedrooms, a gallery wall can create a comfortable feel when there isn’t a lot of space for other decor. Construct around a vanity, giving the impression that the mirror and vanity itself are part of the art. We recommend displaying frames that coordinate with the colors of the room, and use personal art, photographs or dreamy images to make the bedroom a truly relaxing haven. 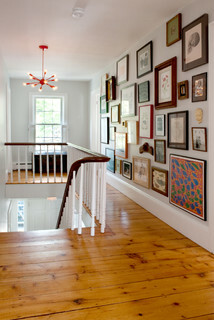 Whimsical frames and eccentric images are perfect for the top of the stairs or a well-lit, casual or airy hallway. Mementos of years gone by in flashy gold, bronze or red antiqued frames as well as children’s artwork in more formal frames mix cheerfulness and formality to create a truly personal yet complementary look to accent a rustic trunk or armchair (or beautiful hardwood floors). The more minimal the hallway, the more freedom you should exercise. In small or more narrow hallways, you don’t want to be overwhelmed by eccentricity; it could leave you feeling a little claustrophobic and be too busy for the space. We like the look of black and white images, or subtlety colored pictures, in white or black frames that match each other. You will still get a beautiful gallery wall effect, but one that is more cohesive and soothes the eye in a minimal amount of space. If you want a little more variety on your gallery wall, or want to tie in the overall theme of a room, add other types of hanging decor the wall. 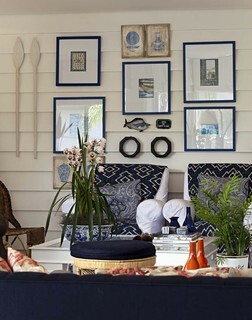 This nautical gallery wall is a great example: a fish wall sculpture, oars and two more shapely accents complement the look and color of the prints while adding a little more intrigue and texture to the flat space. While we were specific with the rooms we included here, note that the strategies mentioned can be utilized elsewhere in your home. Use the bedroom idea around the television in your living room, or a work space in an office; the minimal, more formal look from the hallway also looks elegant in a more formal bedroom; and adding shelves, clocks or quirky accents works with gallery walls in every room. Most importantly, measure your space if you want straight lines, and always remember to make it your own! This entry was posted on Thursday, January 14th, 2016 at 9:12 am	and is filed under Americana, Apartment, Art, Bathroom, Bedroom, Decorating, Dining Room, Holiday Decorating, Home Organization, Kitchen, Renovating, Thematic, Thursday's Theme, Wall Decor. You can follow any responses to this entry through the RSS 2.0 feed. You can leave a response, or trackback from your own site.